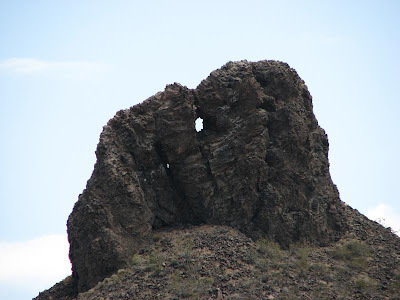 On my way back from Vegas, I drove into the Mojave desert to see a geologic formation that Bill Mann calls the Shaman's Eye. This site is in his Volume 2 book for the Mojave Desert. Located north east of Baker, CA, it's a volcanic neck where erosion has exposed a solid tower of volcanic lava. Devil's Tower is a famous example of this formation. Here's a Google map centered on it. NOTE: for those of you new to my blog, I don't tend to post blatant latitude - longitude coordinates of sites, but you can get that by inspecting the URLs in the Google map links that I offer. 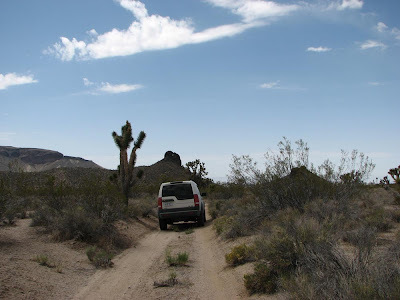 I approached it by leaving the highway at Halloran Summit and driving a short distance on dirt roads that were all in my Garmin Nuvi maps. That part was easy, requiring only high clearance. 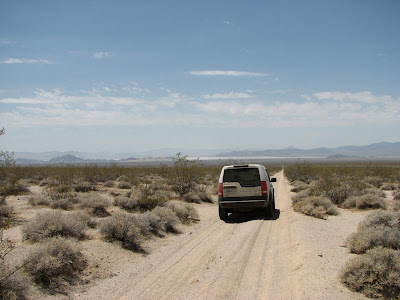 From the site, I continued SW on a long dirt road toward Kelbaker Road that included a couple sandy sections. That part was fun because it was downhill and offered a great view of the desert. Here's a shot looking down that road. You can see Cowhole Mountain and Little Cowhole Mountain and Soda Dry Lake off in the distance. I've now hiked up both of those desert peaks.